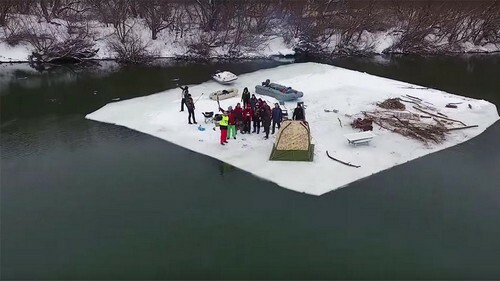 Thrill-seeking adventurers have staged an annual float along Europe’s fifth-largest river on top of a drifting block of ice, complete with a heated bath, a banya and a wakeboard. Videoblogger Bogdan Korzhenevsky said in a YouTube video published Sunday that around 15 enthusiasts took part in the unorthodox picnic on the Don River. It took the group around two hours and two broken chainsaws to cut off a big enough chunk of ice, he said. “They say we’re setting a bad example for young people. That’s true,” Korzhenevsky said in the video blog. “But at the same time, some videos inspired me to take up sports, tourism and other activities,” he said, warning viewers not to repeat their trick. Drone footage showed a chunk of ice with people the size of ants roaming on before splitting off and floating down the river. The block withstood the weight of a cast iron bath, but cracked into several parts after a wakeboard crashed into it, the blogger said. “We were able to realize almost everything we had planned,” the blogger said, before noting that the group did not have enough time to heat up the home-made bathhouse on the block of ice.